Kinnaird Edge (Adjustable Strength) Drone Reeds. Kinnaird Bagpipes is pleased to announce Kinnaird Edge Drone Reeds! * RICH, VIBRANT, BRILLIANT sound! For over 15 years, Kinnaird Evolution and Carbon Fibre drone reeds have been a staple in many pipers bagpipes. Both reed designs have been hugely successful, and played by many top level pipe bands and soloists. The Kinnaird Edge Drone Reeds will continue this tradition but in a radically new way. What makes Kinnaird Edge Drone Reeds so special? The Kinnaird Edge Drone Reeds are the first drone reed to incorporate a patented bendable tongue into the design. This unique feature allows the piper to adjust the strength of the drone reed without the use of the bridle. This is important since it allows the piper, for the first time, to make these adjustments independently. The bridle position determines the tongues vibration frequency and this needs to be matched to the bore of the bagpipe. This coupling between the reed and the bore is critical to optimum sound and performance. All other reed designs require you to change this length to accommodate blowing strength. In many cases this leads to a mismatch between the acoustics of the tongue and the bore, which reduces coupling and deteriorates sound. The bendable tongue design allows a complete range of strength adjustment in one reed. The same reed can be adjusted to accommodate the blowing strength of a new piper all the way up to the strongest band players. Many of the great features of the original reeds are still present in the Edge design  carbon fibre tongue, waterproof glass fibre body, poly nose cone with threaded pitch adjuster, world class air efficiency and moisture resistance. The nose cones have also been upgraded with an easy out design that greatly simplifies removal and installation. How do I the set-up Kinnaird Edge Reeds? 1. A Drone Reed must take only enough air to make it sound while the pipe chanter is being played. Put corks in the middle tenor, and the bass drone. Move the tongue adjustment screw of the outside tenor drone reed down (Clockwise) to weaken the tongue enough so that when you sound the chanter the drone stops. Now move the screw up (Counter clockwise) to strengthen the tongue (move it just a hair) and sound the chanter again. Have patience; continue this process of moving the adjustment screw in infinitesimal steps until you can sound the chanter and play the scale without the drone shutting off. (Do not try to play a tune at this point). Now cork the outside tenor and open the middle tenor and repeat the process until the middle tenor sounds as you play the scale. Finally, repeat the process with the bass drone reed . The next step is to make sure that all three of the drone reeds are taking the same amount of air. 2. 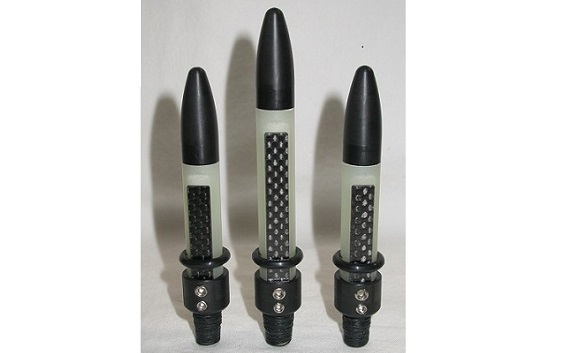 All three Drone Reeds must take the same amount of air pressure. Remove the pipe chanter and put a cork in the chanter stock. Inflate the pipe bag and do the best you can to tune the drones. Now increase the air pressure in the bag. If all three drone reeds are taking an equal amount of air, all three drones will stop (shut off) at the exact same time. If one drone stops, then another then another, the drone reeds are all taking different amounts of air to sound. You won't be able to tune a bagpipe properly if all the drones take different amounts of air. The Drone that shut off first is the one using the least amount of air, so shorten the bridle on the others until you can increase the pressure on the pipe bag and all three of the drones shut off together. Your Drone Reeds are now taking the correct amount of air in order to sound. Question: Gerry, I followed all the steps in setting up the Drone Reeds and I can play up and down the scale no problem, but when I play a tune the drones stop; should I open up the drone reed bridles some more? Answer: No! Don't touch those bridles; you are suffering from unsteady blowingor the clinical term "operator malfunction", now you must lean to blow steady or as it's called in piping blowing tone.